To promote ringing for Divine Service. To promote the recruitment and training of bellringers and to advance the Art of (Scientific) Change Ringing. To provide communication between ringers and to promote social activities. 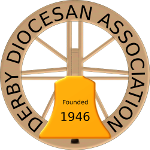 To work with Parochial Church Councils (by providing advice, practical assistance and financial assistance via a bell repair fund) towards the goal that all bells hung for full circle ringing within the Diocese of Derby should be in good ringable order and where necessary to support augmentation projects and the installation of new full circle rings. To extend the appreciation of bellringing among the public. Officers. The Officers of the Association shall be President, not more than three Vice-Presidents, Secretary, Treasurer, Membership Secretary, Peal Secretary, Secretary of the Bell Repair Fund, Treasurer of the Bell Repair Fund, two Trustees of the Association, Central Council Representatives, Quarter Peal Secretary, Webmaster, Bell Consultant(s), Safeguarding Officer, Public Relations Officer and Annual Report Secretary. All Officers except the Bell Consultant(s), Safeguarding Officer and Central Council Representatives shall retire annually, but shall be eligible for re-election at the Annual General Meeting. Up to three Bell Consultants and the Safeguarding Officer shall be appointed annually by the General Committee at their first committee meeting of the year. The Central Council Representatives shall be elected at the October General Meeting in the third year of the Central Council’s triennium. Districts. The territory of the Association shall be divided into Districts determined to suit the prevailing geographical and social requirements as determined by the AGM. Each District shall elect at an Annual District Meeting a District Chairman, Ringing Master, Secretary, two members to the General Committee, two members to the Education Committee, one member to the Bell Repair Fund Committee (the post to be taken up on the date of the Association Annual General Meeting) and any other officers deemed necessary. Determine the Agenda for the Annual General Meeting and October General Meeting. Review triennially the composition of the Districts. Ensure the safekeeping of the Association’s property. Education Committee. There shall be an Education Committee of the Association consisting of two members from each of the Association’s Districts and an Eckington tower member of the Gordon Halls Ringing Centre’s Committee. The Committee shall elect from its members annually a Secretary and Chairman who shall represent the Education Committee on the General Committee. Bell Repair Fund Committee. There shall be a Bell Repair Fund Committee comprising the President, Secretary of the Bell Repair Fund, Treasurer of the Bell Repair Fund, the two Trustees of the Association and one member from each of the Association’s Districts. The Bell Repair Fund Committee shall administer the Bell Repair Fund which may be registered as a charity in which case the members of the Bell Repair Fund Committee shall be registered with the Charity Commission as trustees of the Bell Repair Fund. There shall be a minimum of two Bell Repair Fund Committee Meetings per year at which a quorum shall be four. The Committee shall elect from its members annually a Chairman of trustees and appoint a minute taker. The Bell Repair Fund Committee shall not include persons employed in the bell trade. The Association Officers may question nominees for posts on the Committee to assess their suitability to be charity trustees and have the right to veto nominations. There shall be Honorary Life Members, Resident Members and Non-Resident Life Members. Honorary Life Members shall be elected only at an Annual General Meeting and shall not pay any subscription. A Resident Member or Non-Resident Life Member is eligible for election at any Association meeting having demonstrated that rounds can be rung efficiently to the satisfaction of the District Ringing Master, or appointed deputy, who will second the proposal for membership. Non-Resident Life Members may also be elected prior to a peal attempt, in which case their membership must be ratified at an Association meeting. Honorary Life Members and Resident Members shall be entitled to all privileges of Association membership. Subscriptions shall become due on election and subsequently on 1st January each year. Those members elected after 1st October each year shall pay their first subscription on election and be exempt the following year. The Association shall have the power to expel any member by majority vote at an Annual General Meeting. Any member may terminate his membership by informing an Officer of the Association. If any member shall leave his subscription arrears for two months from 1st January on which it became due and shall fail to pay such arrears within two months after a written application has been sent to him, his name may be removed from the list of members and he shall thereupon cease to be a member of the Association. Anyone whose membership has terminated by default shall only be eligible for re-election on payment of two years’ subscriptions at the current rate (to include the year of re-election). On re-election any past member of the Association may have his original election date recognised as his time of admission to the Association, together with his full total of peals rung for the Association; it being the responsibility of the member to confirm this total with the Peal Secretary. Alterations to the rules or objectives may be made at any General Meeting of the Association. Alteration to the striking contest rules shall only be made at the Committee’s Autumn Meeting. Notice in writing must be given to the General Secretary not later than one calendar month before the relevant meeting and should clearly indicate the proposed additions, deletions and changes. Peals shall be rung in accordance with the prevailing rules of the Central Council of Church Bellringers. All the band must be members of the Association. Peals not conforming to this will be at the General Committee’s discretion as to whether they be accepted or not. The Peal Secretary shall maintain a record of all peals rung by the Association and shall arrange for details of every peal rung to be published on the Internet. Expenses incurred by Secretaries in respect of postage, advertising and hire of rooms for meetings shall be reimbursed. The Association’s Representatives at the Central Council shall be entitled to expenses as determined by the General Committee. The income and property of the Association whencesoever derived shall be applied solely towards promoting the objectives of the Association as set forth above and no portion thereof shall be paid to or transferred either directly or indirectly to any member or members of the Association except in payment of legitimate expenses incurred on behalf if the Association. The Annual General Meeting shall be held on a Saturday in April, to avoid the Easter holiday period. One other General Meeting shall be held on the first Saturday in October. Additionally other General Meetings shall be held as determined by the General Committee or on receipt by the General Secretary of a written request to do so signed by a minimum of 30 Resident Members. All General Meetings will be organized by the General Secretary, who must notify the Secretary of every tower within the Association of the agenda, time and place not less than fourteen days before the meeting. No business shall be transacted at any General Meeting unless a quorum of no fewer than 20 Resident Members is present at the commencement of such business. Changes to the Rules or Objectives requires a quorum of no fewer than 35 Resident Members to be present..
Officers shall be elected as required by Rule 2 i. The Annual Report and Accounts and the report of the Independent Examiner(s) thereon shall be received. Proposals to alter the rules or objectives shall be considered where applicable. Proposals to terminate membership shall be considered where applicable. Any other agenda items put forward by the General Committee shall be considered. The Meeting will determine the subscriptions for the following year. The Meeting shall be informed of the arrangements for the forthcoming Annual Dinner, which arrangements shall have been made by, and shall be the sole responsibility of, the members of the District in which the Dinner is to take place. Two Independent Examiners suitably qualified in accordance with the Charities Acts shall be appointed from those members of the Association who are not members of the General Committee to examine and report on the Annual Accounts of the Association (in the same manner as though it was a charity) and of the Bell Repair Fund. The Central Council Representatives shall be elected in the third year of the Central Council’s triennium. The General Committee may from time to time arrange and propose on such terms and for such sums assured and subject to such conditions as it thinks fit a policy or policies securing benefits for members of the Association while participating in ringing activities. In the event of any claim being made the sum or sums receivable shall be paid to the Trustees of the Association who shall hold the same upon trust for the members who suffered such accidental injury or, if such injury results in such member’s death, upon trust for such of the relatives or dependents or the personal representatives of such member and in such shares as the Trustees shall in their absolute discretion think fit. In the event of the Association being wound up, any assets remaining upon dissolution, after the payment of proper debts and liabilities, shall be transferred to such charitable institution or institutions having similar objectives to those of the Association as the General Committee shall determine.